From what scientists have gathered, galaxies are nearly synonymous with dark matter. They seem to be mostly dark matter with specks of regular matter mixed in. Despite the fact that no dark matter has been directly observed with science experiments, galaxies’ strange motion is the knock-out reason why astronomers think the universe is filled with six times more of this mysterious stuff than regular matter. Except now, astronomers for the first time have identified a galaxy that seems to lack any dark matter at all. This galaxy, called NGC1052-DF2 is entirely new territory as far as observations go. But paradoxically, it might strengthen the case for dark matter’s existence. NGC1052-DF2 shows that these strange, ultra-diffuse galaxies have a whole lot more to teach astronomers. If something has a lot of gravity, then the objects orbiting it need to move quickly around it so they don’t spiral into the center. But nearly every galaxy seems to rotate way faster around its edges than the amount of visible matter they contain would imply. That’s led astronomers to believe that these galaxies are filled with lots and lots of dark matter. 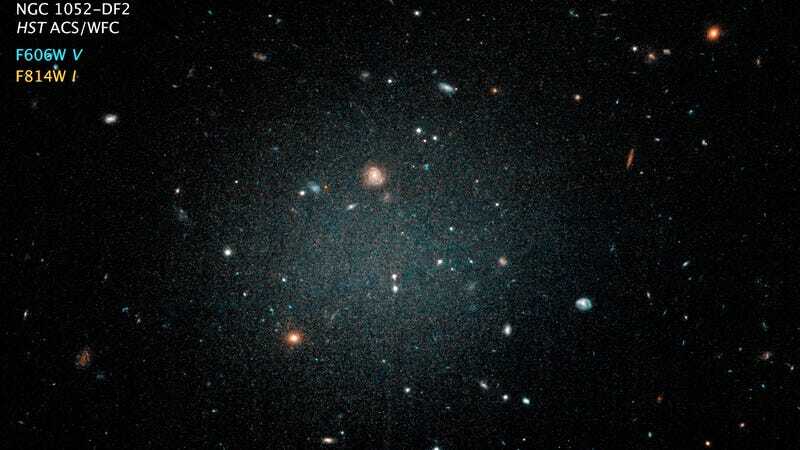 Scientists had already cataloged NGC1052-DF2, but when they monitored the motion of 10 of its bright clusters of stars, it didn’t seem to rotate at all, according to the paper published today in Nature. “We could only derive an upper bound to the measured motion because it’s moving so slowly that our instrument couldn’t detect it,” said van Dokkum. Van Dokkum has characterized other ultra-diffuse galaxies with the Dragonfly Telephoto Array. His team recently discovered another galaxy, Dragonfly 44, whose physical appearance nearly matches NGC1052-DF2. But that galaxy’s velocity implies that it’s more than 99 percent dark matter. Not only does this show the diversity of these diffuse objects, but it actually strengthens the case for dark matter. Several physicists have posited that dark matter is actually just a place where our existing theories miscalculate the effects of gravity in the universe’s larger structures. But those theories would fall apart trying to explain the differing behavior of Dragonfly 44 and NGC1052-DF2. But how would such a galaxy form? Physicist Priya Natarajan, also from Yale, wrote a paper back in 1998 predicting how such a class of dwarf galaxies such as this one could form. She posited that other galaxies could eject gas from energetic supermassive black holes, which would cool and eventually form objects like the one observed by van Dokkum. “It’s obviously a result that is personally of great interest and excitement for me,” said Natarajan, who was not involved in the new study. Van Dokkum himself doesn’t favor any theory for how this object formed, noting that he didn’t observe a nearby galaxy. Others are excited for the galactic oddities the Dragonfly program might uncover. “This is exactly the sort of thing the Dragonfly instrument excels at discovering, and confirming a low-mass galaxy without dark matter is an important step in understanding both galaxy formation and evolution, as well as cosmology,” Sarah Tuttle, astrophysicist from the University of Washington who did not work on this project, told Gizmodo. “It will be interesting to see if the rest of their program provides more candidates for anomalously low dark matter.